Die Boot-Vermietung Moto-Sport Vlado ist gegenüber der INA-Tankstelle und dem Thommy-Supermarket. 5 m Boote mit 6 PS Außenborder, Schlauchboote mit 40 bis 70 PS Außenbordmotor und ein 130 PS Schnellboot für 6 Personen sind im Verleih. Die Mietpreise richten sich nach Saison, Motorkapazität und Bootsgröße. Interessant sind Ausflüge immer. Es lohnt sich ein Trip auf die kleine Insel Žminjak. Auf ihr gibt es nur 4 Häuser und ein gutes Restaurant. 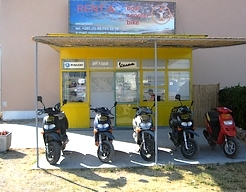 The boat-hire shop Moto-Sport Vlado is opposite the INA petrol station and the Thommy Supermarket. 5 m boat with 6 hp outboarder, inflatable boats with 40 to 70 HP outboard motor and a 130 HP speed boat for 6 persons are available for rental. 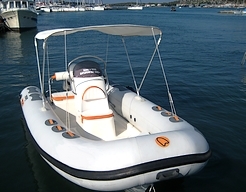 The rental rates depend on the season, boat size and engine capacity. 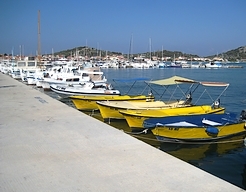 Boattrips are always interesting, but very worth is a trip to the tiny island Žminjak. On it there are only 4 houses and a good restaurant.